Microsoft Xbox One- They're calling it the Xbox One. This name was on no one's radar that I was aware of. They're definitely taking a page from smartphones, tablets, and Nintendo's playbooks with a name like that. It's not necessarily awful. It's one of those "safe" names, though, and not exactly inspirational. It's clear they think they have gamers in the bag with a name like that. That name is for the non-gamers out there. - A next generation Kinect comes with it. - Both the console and new Kinect are very boxy, which is clearly a conscious design decision to fit in with the flat modern interface UI of Windows Phone and Windows 8 (and now this system). At the same time, they're also quite shiny (black), so it's an interesting look. - The Xbox One is designed to pass through and integrate with your TV experience seamlessly. - The Xbox One interface is very much like Windows Phone and Windows 8. This should work well for a TV, big screen experience. - Say, "Xbox on" and the Xbox One immediately takes over your TV. That's the "always on" angle that was causing many people angst. 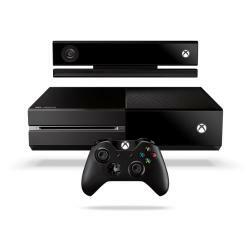 - The Xbox One has instant switching between TV, game, music, Internet, etc. Very fast! - It has a Windows 8-style window snap mode, so you can put something on the side while doing something else. For instance, watch a movie, then snap a browser window to the side. Multitasking is front and center. - Skype HD is built-in. With the always on integration, this could really make video calling faster and easier than ever. - You can say, "Xbox, ESPN," for instance, and it will go immediately to that channel. Presumably this is using some type of IR blaster to control your cable box, though it's possible there may be some deeper integration. Certain channels or events will have deeper integration, for instance, with sports, you might be able to pull up live stats. - The Xbox One Guide provides rich access to current TV listings. Again, when showing this, they're showing how quickly everything switches. As users of the Wii U know, any type of lag can be a killer, so if this is how quickly it works in reality, it's a killer feature. - It's supposed to be virtually silent when running. We'll see, but this is obviously important for something always on. - The new Kinect's voice features are now more conversational and supports multiple family members. - The new Kinect's tracking appears nearly one-to-one, which is a big step up from the original Kinect. - One of the Xbox 360's killer features was its excellent controller. It looks like this winning design was iterated on and improved, but not changed dramatically for the Xbox One. That's probably a good thing. So the three main control methods are controller, Kinect, and smartglass (the second screen stuff for smartphones and tablets that few people use). Kinect is supposed to recognize when you (specifically you) pick up the controller and resumes your specific saved game, as an example. Nice. The more seamless moving between the control schemes, the better. - Xbox LIVE has the same membership structure. All content is stored in the cloud, including your games, making them available from anywhere. We'll see what that means in reality, as there may be some type of PS4-level real-time streaming going on. - Bluray is there. USB 3.0. 500GB hard drive. Etc. All the usual next gen hardware bullet points (at least in terms of Sony's PS4). - EA recently lost interest in the Wii U. Not surprisingly, EA had a big presence at Microsoft's event. EA was making a big deal about a new type of technological core for their games, which may have played into deciding not to support the Wii U. This stuff might simply require PS4/Xbox One/PC-level power and it may not make sense to do separate products for the Wii U considering its present sales pace. - There appears to be some type of instant social sharing like Sony's PS4 will have. - Microsoft is pushing transmedia for Halo (their one major property). Halo will be a television series, but there is a hint that the integration will go a big deeper. - As a demonstration of the Xbox One's integration, they were showing a live NFL broadcast running alongside a fantasy football app, while also running a video chat between friends. If it gets used, it will be a fun social experience. That's a big if, though. Now some will criticize that they didn't show enough games (though there was a major Call of Duty announcement), but that's what E3 next month is for, plus, it's the quality of these other, non-game features that will arguably make or break the system long-term. We already know it will feature and play certain types of games and that the system has a certain amount of power. It's what's done with that power (and, as the Wii U proves, what comes out consistently post launch) that will ultimately matter. In any case, the event was short, but overall pretty sweet. It's now up to E3 for us to see all the other stuff, like launch date (beyond later this year), pricing, major games (they're promising "exclusives", etc.). We just have a few more weeks to wait. "Perhaps most intriguing, however, is that Xbox One gives game developers the ability to access Microsoft’s Azure cloud computing platform. That leads to a few obvious and immediate applications: All your downloaded and installed games and achievements are synced to the cloud and can be accessed and played without interruption on any Xbox One you sign in to; stable, dedicated servers for every multiplayer game rather than the notoriously fragile practice of hosting matches on one participant’s console; even multiplayer matches that can grow to 64, even 128 participants, rather than the usual limit of 16 or 32. When the original Kinect launched, apartment dwellers lamented that they had to move couches and tables just to be recognized by the its depth sensors, let alone play a physically involved game like Dance Central. The restricted field of vision also made it next to impossible for different-sized people, like parents and kids, to play the same game. This time around, a 1080p camera enlarges the sensor’s field by 60 percent—a fact that the entertainment division’s lanky hardware guru, Todd Holmdahl, demonstrates for me by walking his 6? 4? frame toward the sensor. Even 3 feet away, the Kinect’s onscreen display clearly registers his entire body, and he still has room to lift his hands above his head. The camera can also capture video at 60 frames per second for two-way services like Skype—but more impressive still are the Kinect’s tracking capabilities. It’s now so sensitive that it can measure your pulse by monitoring pigmentation change in your face. (It’s partially done via infrared light, which means it works regardless of skin tone.)" It's also been confirmed that new game purchases will be tied to a specific Xbox LIVE account. If you give your game away/sell it, the new owner will have to pay a fee to unlock the game. Also, as expected, no backwards compatibility. That was a given though with the radical architecture change. I must say I'm intrigued. I must say I'm intrigued. I've held off buying a Blu-Ray player all this time, so unless the price is beyond me, I'll be getting one of those soon. The catch is of course is that both PS4 and Xbox One will be out some time in November, though likely for double the price. A big unknown is how much value an Xbox One will hold for someone without a cable or satellite subscription. It seems to really integrate beautifully with something like that. That may also present challenges in Europe versus the US, where it's much easier to derive value if you're not a cord cutter. I'll just assume right now that Xbox One will sell badly in Japan since it's not a Japanese console. "It's also been confirmed that new game purchases will be tied to a specific Xbox LIVE account. If you give your game away/sell it, the new owner will have to pay a fee to unlock the game." WILL NOT BUY.. (goes for the PS4 too) Im sorry.. MUSIC, BOOKS, VIDEOS all are the same as GAMES in my eyes.. content I'm paying for is not the psychical part, but the intellectual part.. and if i can sell used music on a Psychical disc.. there is no way in HECK MS (or sony) is going to change that.. WAY to make the PIRATE WAY look attractive again MS! ms has just made enemies of Rental stores (no more game rentals... game Fly, goodby!) Cable companies that change that easy $5 a month for cable boxes.. nothing like fighting a war on all fronts.. (nobody ever wins those). Trying to put the loss of dollars on used games sales is LOW..
Up side.. it looks damn nice.. and if MS doesn't cut its balls of like it with Media Center.. a DO ALL would be sweet..
"It's also been confirmed that new game purchases will be tied to a specific Xbox LIVE account. If you give your game away/sell it, the new owner will have to pay a fee to unlock the game." WILL NOT BUY.. (goes for the PS4 too) Im sorry.. MUSIC, BOOKS, VIDEOS all are the same as GAMES in my eyes.. content I'm paying for is not the psychical part, but the intellectual part.. and if i can sell used music on a Psychical disc.. there is no way in HECK MS (or sony) is going to change that.. WAY to make the PIRATE WAY look attractive again MS! ms has just made enemies of Rental stores (no more game rentals... game Fly, goodby!) Cable companies that change that easy $5 a month for cable boxes.. nothing like fighting a war on all fronts.. (nobody ever wins those). Trying to put the loss of dollars on used games sales is LOW.. Up side.. it looks damn nice.. and if MS doesn't cut its balls of like it with Media Center.. a DO ALL would be sweet..
Again, think of the Steam (or Battle.net) model. The good thing with tying your game purchase - physical or digital - to your Xbox LIVE account is that in theory you can go to ANY Xbox One and play your game (and resume your saved game, etc.) or other media. Obviously it's a way to curb the sale of used games (and rentals), but there does at least seem to be an upside. Good or bad, the Xbox One is a completely new operating model for a console. Some will argue it goes too far to being a media box, but the reality is that's the kind of thinking you need to get a coveted place in the living room when your competition is $80 set top boxes and other devices. Info on Microsoft's 'Meet Xbox One' page reveals the newly unveiled console allows you to play 'immediately as games install.' The Xbox One can install games to the console's 500GB hard drive. According to one report the console may require games to be installed, with a fee required if you want to install them onto a second account. Either way, going by this, players can boot games as soon as they start installing them. In terms of instantly switching between games and the system's other functions like live TV and movies, as detailed during Microsoft's presser, the page confirms the Xbox One lets you suspend games "right where you left off, so you can resume instantly." Think how the Vita, Wii U, or 3DS work when you exit and suspend a game to use the systems' other functions. Except not with those systems, but with a shiny new Xbox. Update: Microsoft told Engadget that Xbox One 50GB Blu-ray discs automatically rip to the system's 500GB hard drive. Again, not a pre-order, just a notification when it will be available. Microsoft has pretty much made this a USA/Canada only thing with the media and TV integration as things aren't as homogeneously available in other parts of the world. So a lot of the features probably won't work or are very limited in those regions. A fee for installing a game on a second account? machine? Seems like a limitation on second hand gaming to me... And indeed it is. Restrictions and checks on games that are purchased with M$ and publishers wanting another cut when a game is resold. Basically this makes this a system for the hedonistic here and now gamers and will make the games worthless in the future when M$ decides to cancel support. The check and the mandatory install... Thank god there's the WiiU and the current gen systems that don't have all these redirections in place. I can say I won't buy into this business model - call me old fashioned - but I am not pouring money into that bottomless pit as things stand now. Geez the greediness of it all really seems a new way to handle customers. That's a key to me too, how well they'll be able to integrate these nice features in other countries. Hopefully they realize that that's an important hurdle to overcome. As long as you log in with the same Xbox LIVE account, it's supposed to be available from any system. This is not necessarily any different from other systems in place already like Steam and Battle.net. The value of a used game will definitely go down since the new owner will have to pay a fee to activate the content. The rental market will be non-existent. Again, not exactly a positive thing, but not exactly unique to Microsoft or the times either. It truly is adapt to the coming technology or stick with the old stuff. And the dollar sign? Really? I'm surprised you went there. It's not really that black and white. There are some advantages to such a model too, otherwise it wouldn't be attempted. It's every company on the planet's goal to make money and they wouldn't do it if they didn't think they could make more money at it and have people support it. For all the bitching about games like Diablo III and SimCity, they sure did sell well.